Ignoring the Left's resistance, the people of Kolkata and rest of West Bengal today responded in great numbers to the 12-hour Bangla Bandh, called by Trinamool Congress for protecting the poor farmers of Singur, Hooghly, against the forcible transfer of their lands to Tata Motors. 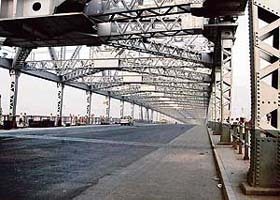 The deserted Howrah bridge during the Bengal bandh called by the Trinamool Congress, against the alleged atrocities by the police on farmers, in Kolkata on Monday. The child labour Act comes into force tomorrow, the proper enforcement of which Prime Minister Manmohan Singh is very concerned about. As the Ministry of Labour gets ready to implement a ban on child labour beginning tomorrow, legal experts claim that it has left out a vital procedure, issuing a notification that enforces the ban. Chief Minister Mulayam Singh Yadav today described BSP founder Kanshi Ram as a leader of great political wisdom who had selflessly worked to challenge the status quo. The Supreme Court today issued notice to the Union Government on a petition challenging the validity of the 93 Constitutional Amendment enabling the Centre and states to pass a law to extend the reservation in unaided private educational institutions. In a setback to the prosecution in the July 11 serial blasts case, seven accused today retracted their confession before a special court saying they were taken under duress by the police. The special court set up under the Terrorism and Disruptive Activities Act to hear the 1993 Mumbai serial bomb blasts cases today found Mohammad Farook Mohammed Yusuf Pawale guilty of setting of explosives at the Air India building in south Mumbai and near Shiv Sena’s headquarters at Dadar. The Special Investigation Team of the Delhi Police today submitted a supplementary status report pertaining to the botched up investigation into the Jessica Lall murder case to the Delhi High Court. Satyabrata Pal, India’s envoy to South Africa, was today appointed as the next High Commissioner to Pakistan. Mr Pal, who succeeds Mr Shiv Shankar Menon, is expected to take up his assignment shortly, an official announcement here said. The Vishwa Hindu Parishad general secretary, Pravin Bhai Togadia, said here today that the VHP would play an active role in the next general elections to defeat parties supporting jihadi terrorism. New singing star trend rocks Bollywood. Arts exhibition wins hearts of admirers. Dalai Lama willing to stay within the constitutional framework of China. The bandh which was more or less peaceful, barring a few untoward incidents, was also organised as a mark of protest against the lathicharge by the police on Ms Mamata Banerjee and several TMC MLAs and workers during their dharna in front of the BDO office at Singhur on September 25. Over 2500 bandh-supporters had been arrested from different districts. About hundred persons were arrested in Kolkata. But most were later released on personal bail. The Congress and other anti-Left parties, including the BJP, PDS, RJD and Samajdawadi Party supported the bandh and actively participated in it. But the SUCI and the CPI(M-L) separately observed the bandh on the same issue. After the bandh , both the TMC and the Congress leaders congratulated the people for spontaneously responding to the bandh call. TMC leader Ajit Kumar Panja declared they would decide their future course of agitation for safeguarding the interest of the poor farmers against the industries' exploitation. He said they were not against Rata Tata or the state's speedy industrialisation but they would not allow the transferring of agricultural lands to industries. Chief Minister Buddhadeb Bhattacharjee and Left Front chairman Biman Bose, however, denied that the people had supported the bandh. The state industries minister, Mr Nirupam Sen, said their decision of allowing Tata Motors to set up a Rs 10,000 crore Tata Motors small car project would not be called off. He claimed that many farmers who had agreed to hand over their lands to Tata Motors had been handed over their cheques today by the BDO at Singhur. Though elaborate arrangements were made for ensuring normal life in the city and elsewhere, the trains and bus services were badly affected following the demonstration. Attendance in government offices and other private establishments was thin. Even at the state government's headquarters at Writers Building, only about 30 per cent of the total employees showed up. But unlike the previous industrial bandh called by the CITU, the offices at the Salt Lake's IT sector today functioned normally with usual attendance. The bandh was also not held in the hills of Darjeeling and the tea gardens in north Bengal. Shortly before his departure today for a six-day tour of Britain and Finland, he issued a strong statement declaring zero tolerance towards the perpetrators of child labour and firm action against those who violate the new provisions of the Child Labour (Prohibition and Regulation)Act. He appealed to people to "abolish this practice". He appealed to citizens, forums representing voices of all sections of the society, employees of the government and other public institutions to join the government's endeavour in ensuring that the law is implemented. The nation has solemnly pledged that children will not be engaged in any form of work at the cost of their right to education. I call upon each one of you to stop employing children as workers and actively encourage children to join schools, he asserted. The Child labour (Prohibition and Regulation) Act was recently amended by the government. It now includes child domestic work as a form of hazardous labour and states that action can be taken against those who employ children up to the age of 14 years in domestic work, including homes, hotels, motels, tea shops, resorts or any other recreational centre. The Act also bans the employment of children in factories, mines and other hazardous work. The decision to ban employment of children as domestic help or servants in even non-hazardous jobs was taken on the recommendation of the Technical Advisory Committee on Child Labour, that said children in domestic labour were often subjected to physical violence, psychological traumas and at times even sexual abuse, adding that such incidents went unnoticed as they took place in closed confines. The Labour Ministry has already prohibited government employees from engaging children as domestic help, issuing a notification warning that anyone employing children would be liable to prosecution and other penal action, including fine and a one-year jail term. If they violate the Act, offenders should be prepared to spend anything between three months and one year in jail. But even as the government gears up for the October 10 child labour ban, social activists fear that the well-meaning law could result in under-age workers getting pushed into hidden and more dangerous jobs. According to legal experts, the ministry should have first notified that a ban on child labour is being enforced. A formality that the ministry, however, thinks is not obligatory. "The Ministry issued a notification on July 10, that said it was intending to ban child labour, on expiry of this three month intent notification, they should have issued another one that would give out the details of the ban, including the date from which it is to be implemented," said Advocate Ashok Agarwal, who has filed a case in the Supreme Court seeking a complete ban on child labour. While Agarwal claims the second notification is mandated by law, the ministry officials dismiss the claim. "There is no confusion from our side, the ban will be effected from tomorrow," said a senior official in the Ministry of Labour. Experts point out that in the absence of a proper notification, the ministry's intent to ban the law remains, "just an intent". On July 10, 2006, the ministry had issued a three months notice of its intention to add employment of children as domestic workers or servants and their employment in dhabas, restaurants, hotels, motels, tea shops, resorts, spas and other recreational centres in the Child Labour Prohibition and Regulation Act of 1986. The move was seen as a relief for children employed in homes and at waiting tables. "The intentions are all right, but the procedure as spelt by the law has to be followed, otherwise, the ban will remain a paper tiger and the efforts that have been made so far to push for a ban on child labour would be all in vain," complained Agarwal. Expressing his condolences at the death of Kanshi Ram, the Chief Minister recalled the days after the demolition of the Babri Masjid in 1992 when he had worked closely with him and against all expectations brought to power a government which no one was expecting. As news of Kanshi Ram’s death spread, mediapersons rushed to the BSP office on Lal Bahadur Shastri Marg that was, however, deserted as most of the senior leaders had rushed to Delhi as soon as the news of his death was received early this morning. Paying tributes to the BSP founder, his erstwhile colleague Raj Bahadur Singh described him as a person who had dedicated his life to the cause of social justice. The Supreme Court today issued notice to the Union Government on a petition challenging the validity of the 93 Constitutional Amendment enabling the Centre and states to pass a law to extend the reservation in unaided private educational institutions. The notice was also issued to Tamil Nadu Government by a Bench of Mr Justice Arijit Pasayat and Mr Justice Lokeshwar Singh Panta as the state already had enacted a law in pursuant to the Constitutional 93 Amendment Act, 2005, which came in to effect from January 20 after the Union Government had notified it. The court directed the Centre and the Tamil Nadu Government to submit their reply. Tamil Nadu is the first state to pass a legislation to implement the OBCs reservation in private educational institutions from June 2007. The accused are Faizal Shaikh, Muzammil Shaikh, Tanvir Ahmed Ansari, Mohammed Kamal Ansari, Ethesham Siddiqui, Sohail Shaikh and Zamir Ahmed Ansari. The stand of the accused to resile their statements given to the police comes 10 days after the Mumbai police claimed that they had cracked the train blasts case. Appearing before special Judge M.R. Bhatkar, the accused said the police had obtained their signatures on blank papers and also they were not produced before a magistrate or Deputy Commissioner of Police (DCP) for recording confessions. Under the provisions of Maharashtra Control of Organised Crime Act (MCOCA), it is mandatory for police to produce accused before a competent authority if they wish to give their confession. The retraction of confessions by the accused came as a surprise to the prosecution as they were still in police custody. Normally, an accused retracts confession when he is placed in judicial custody, legal sources said. Pawale, an associate of Tiger Memon, was found guilty of taking part in the conspiracy in the bomb blasts case. In all he was found guilty on 23 counts. The blast at Air-India building claimed 20 lives while four persons were injured in the Sena Bhavan blast. The Division Bench of Justice R.S. Sodhi and Justice P.K. Bhasin, however, said they would consider the report after conclusion of the appeal filed by the police against the acquittal of the accused. A new FIR in the case was lodged on March 6 after a Sessions Court acquitted all accused on February 21. The court had said the police had no evidence to prove their hand in any destruction of evidence in the case. The High Court has set December 14 as the next date for hearing. Satyabrata Pal, India’s envoy to South Africa, was today appointed as the next High Commissioner to Pakistan. Mr Pal, who succeeds Mr Shiv Shankar Menon, is expected to take up his assignment shortly, an official announcement here said. Mr Menon earlier this month took charge as the new Foreign Secretary superseding 15 IFS officers. The Vishwa Hindu Parishad (VHP) general secretary, Pravin Bhai Togadia, said here today that the VHP would play an active role in the next general elections to defeat parties supporting jihadi terrorism. He, however, clarified that no party could take the VHP support for granted. Togadia, who was here to participate in the VHP's two-day state executive meeting, addressed a press conference. The firebrand VHP leader demanded that all those clamouring for clemency for Afzal Guru should be prosecuted as traitors. He appealed to the President Abdul Kalam to reject the mercy petition.